Excerpted from "Peter Kuper: Conversations," edited by Kent Worcester, from a 2009 interview with Kuper by Christopher Irving (pp. 76-77). Your stencil style: How do you go about doing that? Kuper: I photocopy my pencil drawings, and then cut a stencil out of the photocopy paper. I spray them with enamel spray paint, not an airbrush, so I can pick up one can, put it down, and then spray another fast. How did you first arrive at using stencils for comic book art? Kuper: My lifelong pal, Seth Tobocman turned me on to them. I was looking at an illustration he did this way and it rang my bell. It was apparently a very loud bell, because that was in 1988 and here, to this day, I'm still doing stencils. At this point, I feel like I want to move away from spray paint because of its toxic nature. The irony of doing pieces on our degraded environment using aerosol sprays is too much. Spy vs. Spy is done in stencils, right? Kuper: I did it in stencils when they asked me to try out for the job figuring they wouldn't go for it. I didn't want to try to mimic the style of [Antonio] Prohias', I thought that "If I'm going to do this, I'll do something that's different. I thought they'd thank me for my kooky approach, bid me adieu and I'd go on my merry way." When they said, "You got the job," I thought I'd probably just do it for a year. I'm in my thirteenth year of Spy vs. Spy. Do you do these stenciled comics a panel at a time, or the whole page? Kuper: I do it a page at a time. I usually spray a base in red and black. I spray the red paint first and then spray the black on top of it, which gives a glow of the red under the black. Occasionally I do more than one stencil per piece, but not that often. I'm experimenting now with rolling or brushing on acrylic paint with a stencil. COUNTLESS CAVES PERCH atop the steep-sided mountains of East Kalimantan in Indonesia, on the island of Borneo. Draped in stone sheets and spindles, these natural limestone cathedrals showcase geology at its best. But tucked within the outcrops is something even more spectacular: a vast and ancient gallery of cave art. Hundreds of hands wave in outline from the ceilings, fingers outstretched inside bursts of red-orange paint. Now, updated analysis of the cave walls suggests that these images stand among the earliest traces of human creativity, dating back between 52,000 and 40,000 years ago. That makes the cave art tens of thousands of years older than previously thought. But that's not the only secret in the vast labyrinthine system. In a cave named Lubang Jeriji Saléh, a trio of rotund cow-like creatures is sketched on the wall, with the largest standing more than seven feet across. 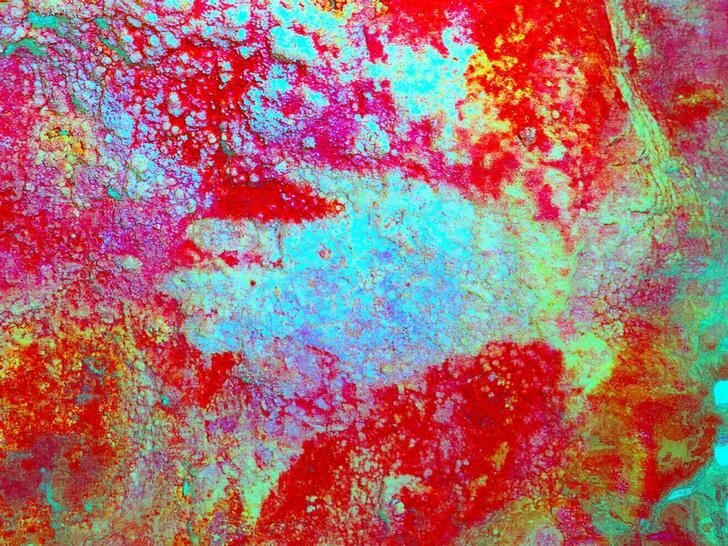 The new dating analysis suggests that these images are at least 40,000 years old, earning them the title of the earliest figurative cave paintings yet found. The work edges out the previous title-holder—a portly babirusa, or “pig deer,” in Sulawesi, Indonesia—by just a few thousand years. “In the entrance, there's a little chamber to the right, and it's there—bam,” says archaeologist Maxime Aubert of Griffith University. It's not the earliest cave art ever found. But unlike earlier scribbles and tracings, these paintings are unequivocal depictions of ancient animals, his team reports today in the journal Nature. The bovines and handprints join a growing array of artwork of similar age that adorns the walls of caves around the world. These paintings mark a shift in how early humans thought about and engaged with their environment—from focusing on survival and daily mundane necessities to cultivating what could be the earliest threads of human culture, explains Paleolithic archeologist April Nowell of the University of Victoria. “I think for a lot of us, that's a true expression of human-ness in the broadest sense of that word,” she says. The folks at FoundSF/Shaping SF have been scanning neighborhood newspapers here in San Francisco and putting them online at Archive.org. 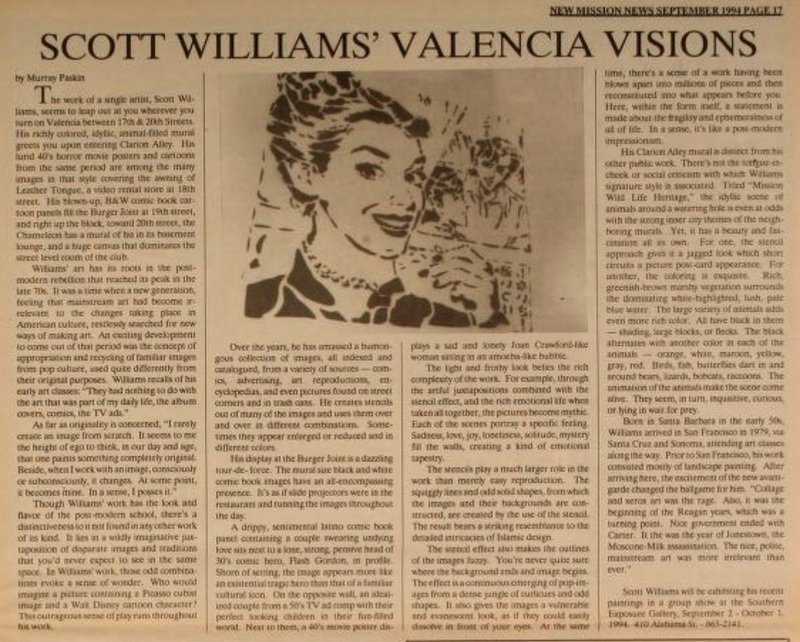 Lisaruth from Shaping SF was nice enough to pass along this 1994 issue of the New Mission News, which included a great article about Scott Williams and his public/exhibited stencil art. Go here for the full article. An excerpt: Williams's work has a "distinctiveness to it not found in any other work of its kind. It lies in a wildly imaginative juxtaposition of disparate images and traditions that you'd never expect to see in the same space." Reproduction allows for the widespread sharing of treasures without endangering them. On a sunny afternoon, the glare in the Getty Center’s Arrival Plaza is blinding—and stepping into Cave 285 feels like teleporting to heaven. 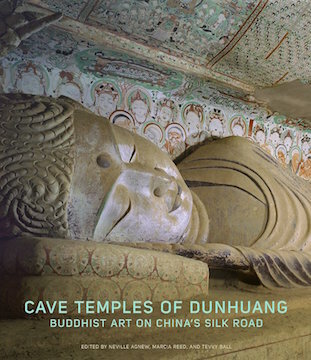 Here, in one of the main features of “Cave Temples of Dunhuang: Buddhist Art on China’s Silk Road,” winged creatures flutter on the vaulted ceiling while, on the walls, Buddhas preach, myths unfold, mortals repent, donors pay homage. Amid scrolling florals and colored flames, a large Buddha sits, his face a featureless mass of clay. This is a full-size copy, created by hand on the basis of detailed scans and myriad photographs of a grotto carved into cliffs that edge the Gobi desert in northwestern China. It is as faithful to the colors, designs and brushstrokes artists used in A.D. 538-39 as it is to the deterioration and damage that nature and man have since wrought. The fragility of some sites has made copies an increasingly viable way to share treasures more widely without endangering them. The Getty’s exhibition uses them in tandem with more traditional displays to bring out the richness, complexity and conservation challenges of one of the world’s great art treasures. Its curatorial team includes experts from the Getty’s institutes for research and conservation, the Dunhuang Academy and the New York-based Dunhuang Foundation, and while theirs is not the first U.S. show to tackle the subject, it is the most ambitious.